The galley equipment market is projected to grow from USD 5.17 Billion in 2015 to USD 6.36 Billion by 2020, at a CAGR of 4.21% during the forecast period, 2015 to 2020. The base year considered for this study is 2014 and the forecast period is from 2015 to 2020. This research report categorizes the galley equipment market by application, by aircraft type, by ship type, by insert type, by fit, and by geography, forecasting revenues and market share, along with analyzing trends in each of the sub-sectors. The ecosystem of the galley equipment market comprises suppliers, technology vendors, manufacturers, distributers, wholesalers, and retailers, as well as aviation and marine authorities. The major players in the galley equipment market include B/E Aerospace (U.S.), Zodiac Aerospace (France), JAMCO Corporation (Japan), and Diehl Stiftung & Co. KG (Germany), and Meili Marine (U.S.), among others. 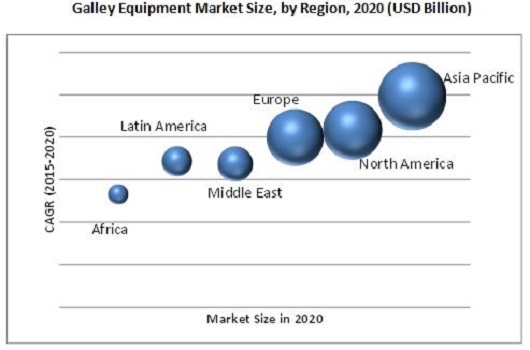 Contracts and agreements comprise the major strategy adopted by the players in the global galley equipment market, followed by new product launches. With the given market data, MarketsandMarkets offers customizations in accordance to company-specific requirements. 14.7 Diethelm Keller Aviation Pte Ltd.
14.8 Air Cabin Engineering Inc.
14.12 Kang Li Far East Pte Ltd.